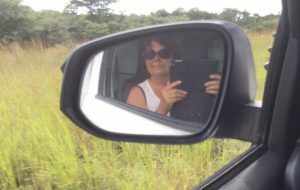 Today we traveled most of the Caprivi Strip, a narrow patch of land that runs about 450 k between Namibia and Botswana. The strip is bordered to the north by Angola, Zambia and Zimbabwe and to the south by Namibia and Botswana. This rainy season this is our only access into Botswana, the more western border is closed due to overland flooding. We’ve been told Namibia is Africa for beginners, and I believe that. Today feels like transition. It’s been a very interesting drive. The highway that goes through the strip is the main B8, paved all the way with a speed limit of 120 kph. 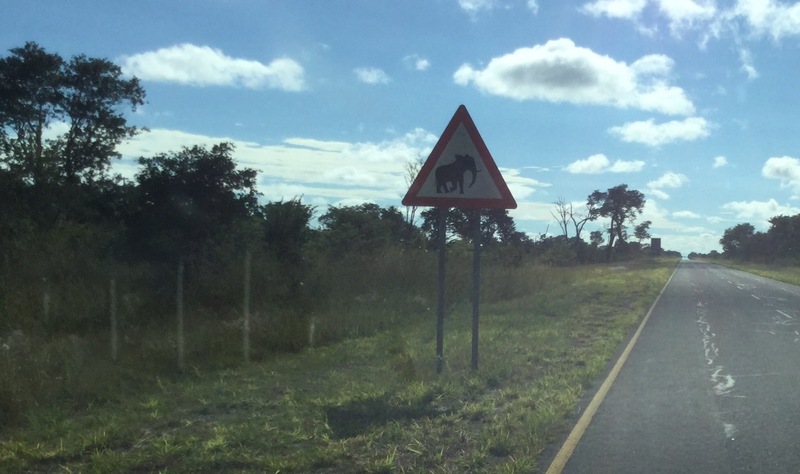 For about 200 k we traveled through Bwabwata National Park, signs warning us of all the wildlife we had to be wary of. Unfortunately we STILL didn’t see elephants, but not for lack of trying. We did see a lot of elephant poop so we’re on the right track. Ray is totally impressing me with his driving, maybe even scaring me a bit. We were looking for elephants and didn’t see any, so he just turned off into the bush on this little 4X4 track and drove for miles and miles into the forest. He didn’t turn around until the sand got so deep we thought we were done for, but then he just went miles in the other direction. What a hoot. We may not have found elephants but we saw a warthog, some kind of antelope that ran away before we got a good look and a turtle. We also saw baboons and ostriches today, and some kind of wild dog we couldn’t identify. If we’d broken down out there, that’s where we’d end I think. Alth ough the speed limit is 120, the strip is full of life and we hardly ever got to speed. People are walking everywhere. There are farm animals being grazed along the highway, cows, donkeys and goats. 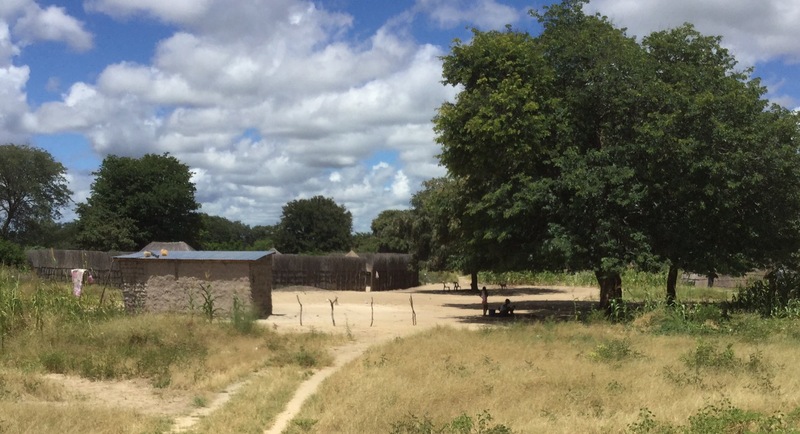 The villages are straw huts surrounded by formidable fences, for those damn elephants and probably lions and leopards. The baboons could also probably wreak havoc on all the beautiful gardens and corn fields inside these walls. There were people selling things all along the way – several stops had meat, big carcasses hanging from trees. 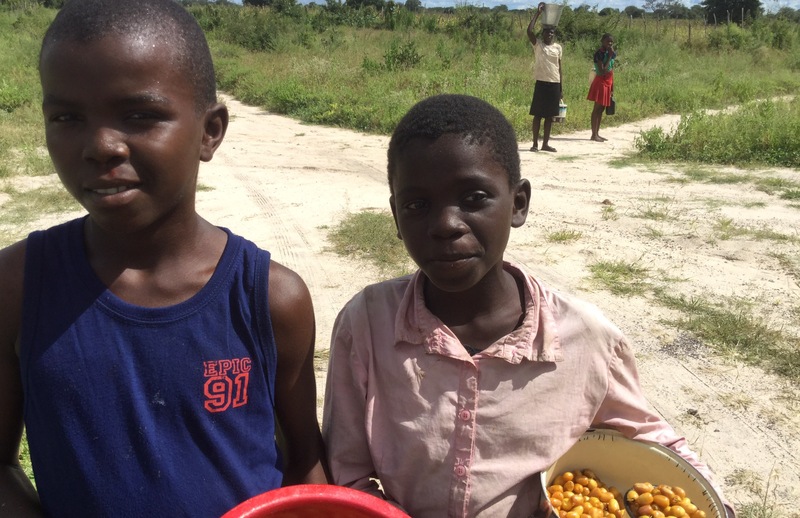 Two boys were selling something by the cup, some sort of fruit that was bitter and mostly pit. We stopped and tasted and decided to pay them for a picture instead. They didn’t understand and probably still think they made $2 for 2 pieces of fruit instead of a whole cup. Suddenly there were craft stands for a few miles, all selling carved elephants and giraffes. 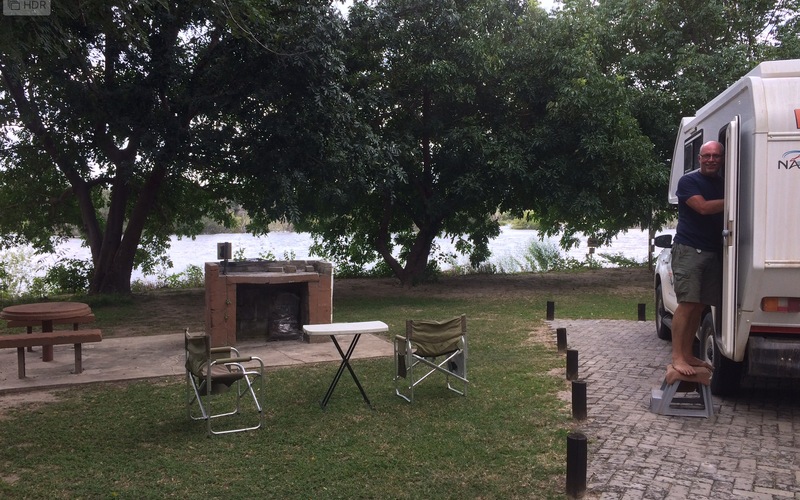 I’m getting a lot of comments on Facebook about how beautiful Africa looks, and how civilized the camping is. I really did know before I left home that this kind of holiday was a thing, but I too am surprised at the comfort of it all. Namibia, at least, seems to understand tourism and employment. Every place we stayed is teeming with staff – literally people straightening the grass sometimes. They make us feel like our business is appreciated. Not every place is the same, and we’ve turned and left a couple, but most places pleasantly surprise us. It’s not unusual to drive miles down a rutted 4X4 track, wondering where the heck we’re going, only to arrive to a uniformed man operating a stately gate, with pools, restaurants and viewing decks. It’s been pretty cool. Tomorrow we leave Namibia. Botswana is mostly flooded and most of the roads are closed. We have a plan, but no idea if the plan will work. Seeing Ray drive, and the roads he’s willing to take, I’m sure we’ll be either fine or dead. Seriously though, our plan is to get to what looks like a civilized place called Kasane and hire a professional to take us into the flood zone, probably by boat. Africa for beginners is over. Love your blogs! Your description of the trip is excellent – love the pictures, too. Be careful, Ray, where you go; we want you guys back here someday in the near future!! I’m sure the whole adventure is very exciting for you both. Wish we had that kind of courage and adventurous spirit when we were younger. Glad you’re going for it! Did you ever read the series set in Botswana about the Lady Detective (Alexander McCall Smith, I think, was the author)? It was a great series and gave me a desire to see Botswana someday; of course, it will never happen in this lifetime. Look forward to more blogs! Are you nuts??? Driving down a side trail til the sand gets too deep sounds terrifying! I’d give that husband of yours “the look”. Oh Pat, I’m giving him the look. I’m loving it!